Samuel Timothy "Tim" McGraw (lahir di Start, Louisiana, Amerika Serikat, 1 Mei 1967; umur 51 tahun) adalah penyanyi Country Amerika. Tim McGraw telah merilis 11 album studio. McGraw juga memainkan beberapa film seperti The Blind Side dan Country Strong. 2006 Flicka Rob McLaughlin Nominated – Critics Choice Award for Best Song: "My Little Girl"
1997 The Jeff Foxworthy Show Lionel One episode; "Feud for Thought"
1998 Billboard Awards Country Single of the Year – "Just To See You Smile"
CMA Single of the Year – "Live Like You Were Dying"
Academy of Country Music Song of the Year -"Live Like You Were Dying"
Academy of Country Music Single of the Year -"Live Like You Were Dying"
Grammy Award Best Male Country Vocal Performance – "Live Like You Were Dying"
Country Music Television Most Inspiring Video – "Live Like You Were Dying"
^ "Tim McGraw Awards". Curb Records. 2007. Diakses tanggal March 15, 2007. 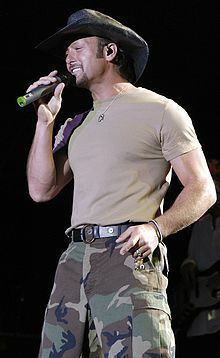 Wikimedia Commons memiliki media mengenai Tim McGraw. Halaman ini terakhir diubah pada 25 Oktober 2016, pukul 11.39.